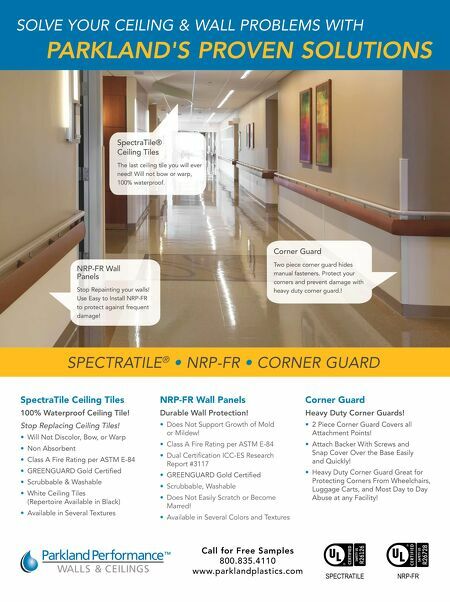 Call f or Free Sample s 8 00.8 3 5.411 0 www.par kl an d p l astics.co m S PE C TRATILE NRP-F R SOLVE YOUR CEILING & WALL PROBLEMS WITH PARKLAND'S PROVEN SOLUTIONS SPECTRATILE ® • NRP-FR • CORNER GUARD SpectraTile Ceiling Tiles 100% Waterproof Ceiling Tile! Stop Replacing Ceiling Tiles! • Will Not Discolor, Bow, or Warp • Non Absorbent • Class A Fire Rating per ASTM E-84 • GREENGUARD Gold Certified • Scrubbable & Washable • White Ceiling Tiles (Repertoire Available in Black) • Available in Several Textures NRP-FR Wall Panels Durable Wall Protection! • Does Not Support Growth of Mold or Mildew! • Class A Fire Rating per ASTM E-84 • Õ> iÀÌwV>Ì -,iÃi>ÀV Report #3117 • GREENGUARD Gold Certified • -VÀÕLL>Li]7>Ã>Li • iÃ Ì>ÃÞ-VÀ>ÌVÀ iVi Marred! • ƂÛ>>Li-iÛiÀ> ÀÃ>`/iÝÌÕÀiÃ Corner Guard Heavy Duty Corner Guards! • 2 Piece Corner Guard Covers all Attachment Points! • Attach Backer With Screws and Snap Cover Over the Base Easily and Quickly! • Heavy Duty Corner Guard Great for Protecting Corners From Wheelchairs, Luggage Carts, and Most Day to Day Abuse at any Facility! NRP-FR Wall Panels Stop Repainting your walls! Use Easy to Install NRP-FR to protect against frequent damage! Corner Guard Two piece corner guard hides manual fasteners. Protect your corners and prevent damage with heavy duty corner guard.! SpectraTile® Ceiling Tiles The last ceiling tile you will ever need! Will not bow or warp, 100% waterproof.